As the Government faces increasing resistance from business, universities and unions over its plans to cap skilled immigration, a study by the UK Border Agency (UKBA) reveals that only 25% of skilled migrants (Tier 1) were confirmed in skilled work and 29% of skilled migrants were working in low-skilled jobs. However - the UKBA data has been wildly misinterpreted by right wing newspapers, such as the Daily Mail. As the Government faces increasing resistance from business, universities and unions over its plans to cap skilled immigration, a study by the UK Border Agency (UKBA) reveals only a quarter of skilled migrants (Tier 1) were confirmed in skilled work and 29 per cent of skilled migrants were working in low-skilled jobs. The data, however, has been wildly misinterpreted by right wing newspapers, such as the Daily Mail. It is important to understand the change to skilled immigration caps against the backdrop of the pre-capped Points-Based System (PBS) introduced by the Labour government. The independent Migration Advisory Committee has already done some detailed work in this area, but analysis has always been limited by the lack of data about what happens to migrants who come through the PBS once they arrive in the UK. So additional data about the outcomes of the PBS is welcome, and yesterday the UKBA published details of a new study of migrants coming to the UK via Tier 1 (highly skilled) of the PBS. Unfortunately the data which the study is based on is weak. The way in which the report has been trailed and messaged rather suggests the Government is more interested in making the political case for its flawed cap policy than in improving understanding of how the immigration system is working. The Daily Mail have used the UKBA study to claim that “just a quarter of immigrants allowed into the UK because they are ‘highly skilled’ is actually in a top job”. This is misleading. The UKBA study is based on a sample of just under 1,200 Tier 1 migrants who applied to bring dependents to the UK in June 2010 – this sample therefore excludes migrants without dependents, and it is not clear how representative it is. Almost half of the sample was ‘unclear’ – meaning that no data could be extracted about employment. Although the study did find that only a quarter of the Tier 1 migrants in question were in confirmed high-skilled work, it found that only 29 per cent were in low-skilled work – not the 75 per cent the Daily Mail headline might imply. With almost half the sample returning unclear data, it seems difficult to conclude much from this. It also seems strange to try, given that better data exists – an evaluation of Tier 1 published in December 2009, based on a more representative questionnaire, in which only 2.4% of respondents provided insufficient details on their employment, found that 14.9% of Tier 1 migrants were managers or senior officials, 36.4% were in professional occupations and 14.5% were in associate professional or technical occupations. Overall, 70% were in skilled work, while only 20% were in unskilled work. This was despite the fact that the data for this study were collected in the first quarter of 2009, during the depths of the recession. It is also important to note that, of the 29% of Tier 1 migrants in the new study who were found to be in unskilled work, almost half were on the Tier 1 ‘post-study’ route for foreign students graduating from UK universities. In the face of one of the toughest graduate employment markets that the UK has seen for decades, it is perhaps not surprising that this group has struggled to find highly-skilled and highly-paid work. Finally, it is important to note that, although Tier 1 migrants do not need a job in order to come to the UK, they do need one to stay. Tier 1 visas are initially issued for two years; migrants wishing to stay in the UK longer than this need to demonstrate that they are earning at least £25,000 (and usually more). The 29% of migrants identified as being in low-skilled work in the UKBA study will not be able to stay in the UK unless they acquire highly-skilled, or at least highly-paid, jobs. Damian Green is of course right to say that “highly skilled migrants should do highly skilled jobs”, but he’s on shaky ground in implying that highly-skilled migrants coming to the UK under Tier 1 are entering the low-skilled job market in significant numbers over a sustained time period. This looks very much like an attempt to justify a drastic reduction in Tier 1 visa numbers under the proposed cap, but excluding the ‘brightest and the best’ from the UK will not help the unemployed, and it could undermine the economic recovery. The trouble I have with allowing any highly skilled person into a highly paid position is that in general I get the impression that the amount paid to the incoming worker is significantly less than would have to be paid to a British Graduate of British birth. To say on one hand as this government and previous governments have that we in the UK have the most intelligent graduates from our highly rated Universities and then to say it is right that companies should be allowed to bring in overseas workers to fill the gaps in the system begs the question who is lying? In addition, the sample does not include main applicants who already brought in their dependents. 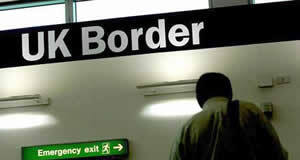 Therefore, the sample is restricted only to those who were not able to come to the UK with their family. It would not be entirely surprising to me then that the people selected for the survey might be poorer, and therefore more likely to engage in less skilled jobs, than the applicants not included in the sample. Given that the latter group constitutes a large majority, the sampling frame becomes all the more questionable.